Cherrie at the accessible Red Fox yurt at Snow Mountain Ranch, near Granby Colorado. I first discovered yurts about 12 years ago, when I was doing a story on the Oregon Coast. I accidentally stumbled into a campground and saw this domed tent and wondered what it was. Come to find out it was a yurt, and at that time they were all the rage at Oregon state parks. Today yurts come is all sizes and configurations, but they all retain the round domed shape. Think of it as something between tent camping and a cabin. They have wood or cement floors and are furnished with beds and usually a table and chairs. Some yurts have electricity, and I’ve even seen a few with bathrooms. The good news is, more and more accessible yurts are popping up at campgrounds across America. 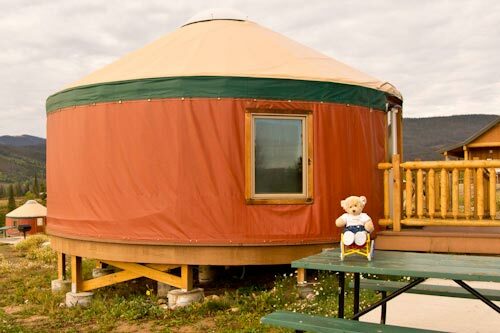 And since I wanted to try all sorts of lodging on our road trip, I decided to introduce Cherrie to yurts in Colorado. And it was a rip-roaring success. Our first yurt experience was at Snow Mountain Ranch, near Granby Colorado. Even though it was pouring down rain when we arrived, the storm was short lived, and soon there was a double rainbow over our Red Fox Yurt. There was parking right next to the yurt, so it was easy to unload. This yurt also had a refrigerator and a microwave and inside lights and outlets. There were two sets of twin bunk beds and one double bed, and plenty of room to move around in a wheelchair. As an added bonus, they also included towels and bedding, so we didn’t have to break out the sleeping bags. The accessible shower room was located just a short distance from the yurt, and although it would have been nice to have a bathroom in our yurt, it was very doable. Additionally they had a nice swimming pool with ramp access and a water wheelchair. Cherrie had a great time swimming!! The other yurt we stayed in – The Bobcat — was located in Golden Gate Canyon State Park at Reverend’s Ridge Campground. Cherrie really liked the large deck, where we had a good time star gazing at night. This yurt also had electricity, but no appliances. There was a charcoal grill outside though, right next to an accessible picnic table. Linens were not provided at this yurt, but that’s OK, because we came prepared. This yurt also slept six, but it had one double bunk bed and one twin bunk bed. Cherrie had no problem getting into the 23-inch high bottom twin bunk, while Charles and I shared the lower double bunk. It was very comfortable. And although the shower facilities were located across the campground, there were accessible toilets just a short walk from our yurt. We ended up driving over to the showers in the morning, Cherrie was able to use the nicely done roll-in shower with a fold-down shower bench. Al in all, I’d say we had a good yurting experience. We didn’t’ have to pack along a lot of supplies, and we were able to get up-close-and personal with Mother Nature for a few days. It’s really a great way to experience a state park, and I’m glad they are making more and more yurts accessible. So give it a try next you hit the road – who knows, you might like it as much as Cherrie did. 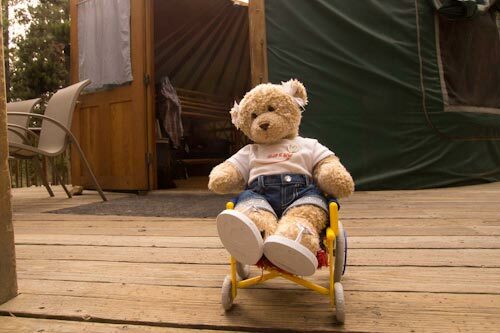 This entry was posted in Recreation, Road Trips, Traveling Cherrie and tagged barrier-free travel, Colorado, Golden Gate Canyon, Reverend's Ridge, Snow Mountain Ranch, Wheelchair Accessible, wheelchair travel, Y of the Rockies, yurts by Candy B. Harrington. Bookmark the permalink.